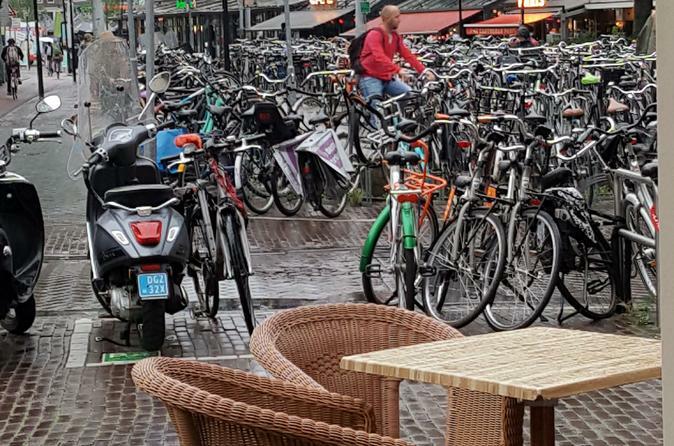 Ammirate i bellissimi canali di Amsterdam di notte con una crociera a lume di candela di 1,5 ore. Imbarcati su una barca confortevole, accomodati nella cabina tutta in vetro al bagliore della luce delle candele e goditi il paesaggio mentre navighi tra i canali del sito patrimonio mondiale dell'UNESCO. Passa accanto a monumenti illuminati come la Westerkerk e la casa di Anna Frank e assapora le luci scintillanti e le sagome dei ponti dei canali, delle case dei mercanti e delle chiese. Mentre navighi, ascolta la storia della città dal commento a bordo e goditi un rinfresco al bar, incluso un drink in omaggio. Scegli tra tre orari di partenza serali per vedere la città al tramonto o illuminati di notte, oltre a un drink è incluso. It's not a bad experience, but its not a good experience either. Main problem: the windows are tinted! For a night cruise, this makes it next to impossible to see anything. Secondly, it is crowded and the music/sound is garbled. Lastly, the boats are so low it is difficult to see anything. I understand this is the nature of being in a boat in a canal, but the seat design makes it difficult to lean to the window to try and see something. The positives: If you go to the outside area, you can see a little better. Make sure to bring a light jacket. The cruise operators are nice and friendly as well. Loved this cruise! We went our first night in Amsterdam and got to see so much of the city- by boat! First drink was free but there is the option to buy additional beer/wine/sodas. In July/August, the sun sets later so we picked a later tour and were very glad we did because even at 10PM it was just getting dark. A lovely way to see the city by night. Our tour guide was very knowledgeable and very funny too! We must have been on every canal in Amsterdam. It was beautiful with all the lights. Fun to see the city from another side.Great value. We really enjoyed our evening. An enjoyable trip. I'm pleased we chose to do it after dark as I think it would have been not as good in daylight. I would tell travelers to do this when the weather is warmer outside. Its really difficult to enjoy the evening cruise with all the windows closed because it is cold outside. The glare of the glass makes it hard to see the sights around the city. It is a great cruise we just unfortunately did get the best experience because of the weather. 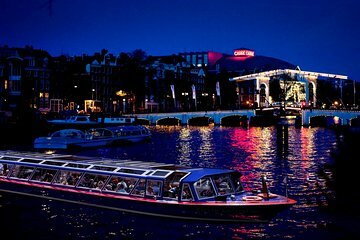 The canal cruise was a wonderful way to end a beautiful winter day in Amsterdam. We always try to take an Evening Cruise if available in each city we visit. The bridges are normally lit up and many times the beautiful buildings surrounding the water are also lit. Amsterdam was a magical city. Very walkable - even in the dead of winter.